Any reason to upgrade to Atmos if I am only at 5.1 channels? Discussion in 'Computer Audio' started by quiktake, Apr 14, 2019 at 7:35 PM. I currently have a beastly 50 lb Onkyo 1007 driving a 5.1 channel system. I have tried other speaker configs up 9 channels but due to room issues and the fact that most movies have been 5.1, I haven't bothered to seriously look into an atmos setup. I am getting the upgrade itch along with some connection/ compatibility issues due to 4k. Otherwise I think you should wait for HDMI 2.1 receivers before upgrading. I think the biggest upgrade for a system is Dirac Live room correction, maybe look into an Arcam or NAD receiver with this feature once 2019-2020 receivers start showing up with HDMI 2.1. I've been running a 7.1 system for the last 7 years and haven't felt a need to upgrade to more speakers honestly. There was an improvement going from 5.1 to 7.1 as the surround output became more consistent from movie to movie. I think if you have speakers that have wide dispersion, and are consistent in their imaging on the vertical axis, having height channels is less interesting. If you are big on digital streaming from netflix, amazon or hulu there would be no need to upgrade to 7.1 or atmos. I have a 5.2.2 atmos setup and it is amazing for the content that uses it or DTS:X. I am disappointed in the available content out there from a digital stand point otherwise I find it quite lovely. If you are staying with 5.1 channels it offers nothing. You need the processor, amps and specific type of speakers to mount high up and/or reflect sound off the ceiling. Netflix has Atmos content. Not much at the moment, but im sure theres more to come. A friend of mine has a 13.3 setup with one 18" sub and two 15". And a 120" screen... I'm still hanging with 7.1 personally. I like it, and thought it was worthwhile in my setup. But I’d call Atmos ceiling speakers a 15-20% improvement over a competent 7 or 9 channel base system. Certain movies are incredible with it - Blade Runner 2049, Mad Maxx Fury Road etc. Going to ceiling speakers with Atmos is a bigger difference IMO than going from 5.1 to 7.1 in a small room. In a big room you are probably better off with 7.1 than 5.1.2. Ah nice to know, I have seen Dolby Audio or Dolby Vision but never Dolby Atmos. Yes sir, Altered Carbon is the first thing that comes to mind. My system is NHT Classic 3’s with homebuilt 12inch ported sub tuned to 27hz. I have been very happy with the setup for 9 or ten years. Sweet! Will check it out! Atmos is only good if you are watching a movie that is mixed well enough to take advantage of it. Getting a receiver and bluray player along with a 5.1 setup is easy enough, but it is also highly dependent in having the correct layout. Atmos doesn't work unless your regular channels are mounted on the floor or wall, close to ear level. 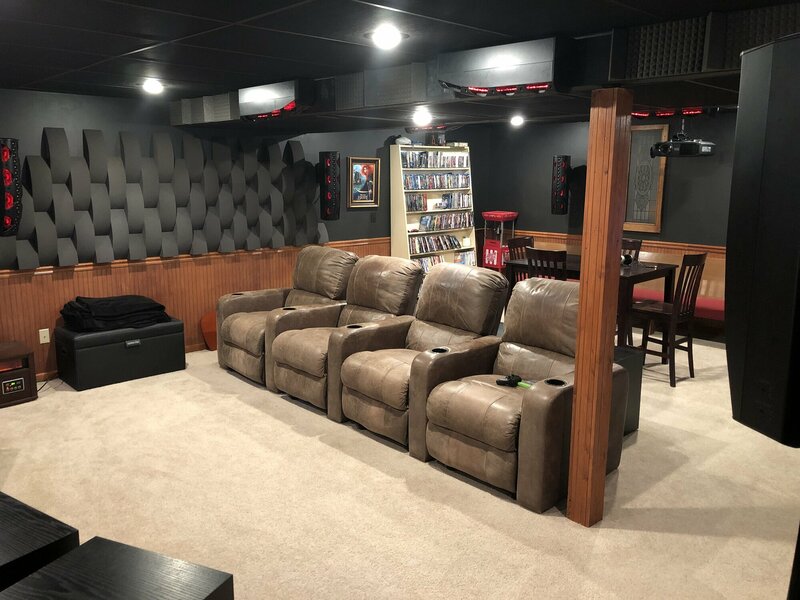 I see a lot of newer homes being sold with in ceiling speakers for the "5.1" setup, but Atmos doesn't work or works very poorly in this kind of layout.